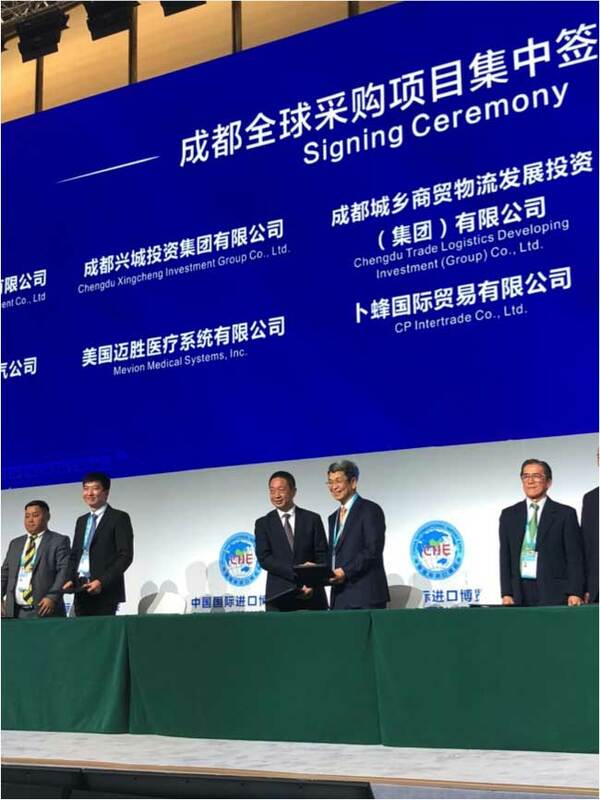 On November 7th, at the China International Import Expo in Shanghai, Mevion Medical Systems and Chengdu Xingcheng Investment Group agreed upon a joint framework agreement to co-develop proton therapy centers and advance clinical research in the field of particle therapy. There are over 4 million new cancer diagnoses in China every year, with an average of 11,750 cases per day or 8 diagnoses per minute. The annual death toll from cancer in China is 2.8 million. In Sichuan province alone, there are 200,000 newly diagnosed cases each year. Cancer mortality in China is considerably higher than in the United States, due in part to lower utilization of radiotherapy. Proton therapy is a precise form of radiation therapy that can reduce damage to non-cancerous tissues. China’s proton radiotherapy market has enormous potential, with demand expected to approach 1,000 rooms in the next 20 years. Mevion Medical Systems and Chengdu Xingcheng Investment Group have agreed to carry out a strategic partnership to utilize their complementary resources to build a leading proton therapy center in Chengdu. This project will create a center of excellence that will advance the field of proton therapy in China through leading cancer care, clinical research, and medical staff training. The proton therapy market continues to grow based on the strength of integrated, single-room systems pioneered by Mevion Medical Systems. Mevion recently, announced that the Huntsman Cancer Institute at the University of Utah officially purchased a MEVION S250i® Proton Therapy System, and that Barnes-Jewish Hospital is constructing their second Mevion system. Two more HYPERSCAN centers are in the final stages of installation and will be treating patients by the end of 2018. Mevion Medical Systems, Inc. is a leading provider of proton therapy systems for us in radiation treatment for cancer patients. Mevion is based in Littleton, Massachusetts, with presence in Europe and China. For more information, please visit www.mevion.com.